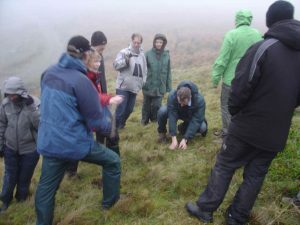 Host of the third transnational meeting in November 2010 was the Welsh project partner, the Institute of Biological, Environmental & Rural Sciences (IBERS) in Aberystwyth. The meeting gave the platform for intensive exchange of experiences made during the last harvesting season. Technical aspects of the mobile demonstration plant (meanwhile called blueConrad), procedures and problems of harvesting, newly initiated fertilisation trials as well as socio-economic research aspects were discussed. Furthermore the activities following in the next year were planned, e.g. combustion trials, research on consistence and marketing of pellets performance of several micro-studies etc. Beyond the partners got the chance to visit the actually installed PROGRASS demo-plant, combined with a guided walking tour to other related research facilities on the site of IBERS. Additionally a field visit to the demonstration and experimental plots of the host partner were possible. Only the weather played an uncomfortable role with slight but continuous rain.